2 "Let's do it!" Tom said. 3 "Let's do what?" I answered. 4 "Do the Paddle Fest." 5 "Are you crazy? 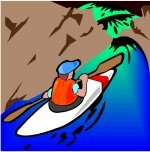 What do you know about paddling?" 6 "I know plenty. Just ask my parents," Tom said with a grin. "Just kidding. I never got paddled. But I have been kayaking lately." 7 "I didn't know that." 8 "My dad and I just started. It's pretty fun. We have an extra kayak. Why don't you join us?" 9 I agreed reluctantly. I'd been in canoes before. Once when I was about 12, we tipped over, and I fell into the water. Water went up my nose, and I also swallowed some. It was scary for me, so I never got in a small boat again. 10 However, I did not want to admit my fear to Tom. So I agreed to go. 11 On Saturday, I woke up early. Not because I was excited, but because I was nervous. What had I gotten myself into! ?